by Chris Woodford. Last updated: January 23, 2019. Do you break out in a cold sweat every time you have to write an essay? Does the mere thought of the word "essay" fill you with fear and dread? If your life plunges into an "essay crisis" every week or two, you've come to the right place. Writing an essay doesn't have to be a chore. Approach it in the right way and you'll not only score top marks, you'll learn a great deal about your subject and you'll probably even enjoy it! Here are my 10 tips for writing a brilliant essay. You can use them for writing other things too—they'll work for everything from magazine articles to full-length books. 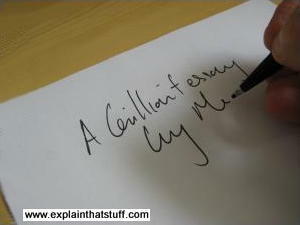 Photo: Do you want make essay-writing hard by making yourself hate every minute? Or do you want to make it easier by making it more interesting? Long experience tells me that the best way to write something is not to leave it until the very last minute. I find the best approach is to write something, leave it for a few days or even a week or two, come back to it, read through it, and then rewrite it. Taking this lengthy, leisurely approach isn't always possible if you have a tight deadline, but it usually pays big dividends. You'll find that leaving time between the writing and rewriting stages makes a huge difference to the quality of your work, because you can assess what you've written more objectively. It's almost like reading someone else's work: you can be much more honest with yourself about what you've done. You don't have to waste time by taking your time. If you have two essays to write, don't do them back to back. I would write one of them roughly, put it to one side while you begin work on the next one, then, after a few days, return to your first piece and finish it off. Once that's done, go back to the second piece (which has been resting in the meantime) and finish that off as well. Teachers will tell you that one of the most common reasons for students writing poor essays is because they don't properly read and digest the question before they start work. This is particularly true in exams, when time pressure makes us all too keen to put pen to paper. Whether you're in an exam or not, take a little time to think about what you're being asked. If you write 10 brilliant pages answering totally the wrong question, you might as well not bother. Don't just read the question, try to understand what you're actually being quizzed on. Sometimes the real question is hiding inside a form of words you may not instantly recognize. (Teachers are crafty like that.) Before you begin work, you need to know exactly where the question is coming from. "Ah, so this is really a question about..." is what you should be thinking. If you're not in an exam, spend a few minutes or even longer sketching out ideas on a blank sheet of paper or in a blank word-processor document—brainstorming, in effect, the kinds of themes you might write about. This will help you decide what kind of research you need to do, and what angle you might take in answering the question. For example, suppose your essay question is: "Climate change is the biggest threat facing humankind in the 21st century. Discuss." You could write any number of different essays on that topic, so sketch out some ideas before you begin. Will you talk about the science of climate change? Will you talk about other social, political, economic, and environmental issues that people have to face? Will you try to agree with the question or argue strongly against it? Or will you take a measured view and balance both sides? Decide on a broad approach to how you will tackle the question before you go any further. You don't necessarily have to stick to this. Indeed, the research you do next may well change your ideas. But think in broad terms about the question before going any further. Apart from anything else, that gives you an opportunity to put some of your own ideas into the essay rather than simply relying on other people's work. And that'll make essay writing seem more interesting and creative. If you understand the question and you've sketched out some broad themes, doing research is an awful lot easier. Even so, finding source material can still be daunting. If you walk into a library with the idea of researching a huge topic like climate change, you could be there for days, months, or even years! Similarly, if you plan to do a lot of your research online, you may find typing "climate change" into Google throws up rather more hits than you can hope to process. Photo: You can make research a whole lot easier if you find out about small, key topics one at a time instead of trying to do all your research at once. How can you make sense of all this stuff? If you've thought about the question and written down some broad themes, you can research each theme separately. 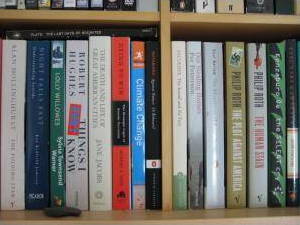 You'll find it an awful lot easier, for example, to research a topic like "impacts of climate change on food production" or "impacts of climate change on human health" than to try to research the entire literature on climate change all in one go. Simply work through all the themes you've identified and research them one at a time. If you're researching online, try to use the most reputable, trusted sources (ideally use "primary sources" wherever you can rather than recycled information from untrustworthy places). If you're using a secondary source, try to follow back to the primary sources it used originally and look at them for yourself. It might sound like an awful lot of hard work, but I can promise you a decent plan will make the actual writing far easier and vastly improve the quality of your essay. Whether your essay has to be handwritten or typed, the best way to plan out the structure is using a word processor. Open a new document, write the question at the top, then write out your key theme ideas in a logical order underneath. Make each theme into a heading. It's easy to move them around until they fit into a sequence you're happy with. Then you can flesh out some ideas of what you'll write or what points you need to make underneath the headings. If you're working with online sources, it's relatively easy to write a plan as you're doing your research, making notes from articles as you read through them. You can easily sort the little bits of research from different books or articles into order as you go along (putting them under the appropriate headings in your plan) and this will save you having to keep looking things up when you write. If you make notes like this, keep a record of where each item came from so you can go back to the original later if you need to. (Use abbreviations or author names and page numbers, such as "Gibbs p370" or paste in the URL of any Web resources.) You can even color-code different bits of text from different sources if you wish. It's quite common to be given a word count (or page count) when you're given an essay title. One reason for this is to make sure you write a decent amount of information; another reason is to stop you waffling on forever and a day: the word count helps to focus your thoughts and make your writing more concise and clear. If you write a plan before you write your essay, word counts will give you no problem: all you have to do is divide the word count by the number of topics you want to cover and assign the relevant number of words to each topic (remembering that some topics will be more important than others). You'll want to do at least a paragraph on each topic, which means that the minimum number of words for any topic shouldn't really go below about 100 (this paragraph, in case you're interested, is just under 200 words). If you find you have too few words to cover all the topics you want to include, drop the least important topics or combine two or more topics into one paragraph. Planning the structure of your essay and assigning word counts before you start will solve two age-old essay problems at a stroke—running out of words with lots of things still to say and running out of things to say with lots of words left to fill. Most people would start here, poring over a blank sheet of paper and trying to tackle the question cold. If you're smart and you do all your planning and research first, you've already done 50-75 percent of the work when you sit down to write. If you have a decent plan, all you have to do is work through it fleshing it out, rewriting it, making links (transitions) between the different topics, and so on. With proper planning, you'll find the actual process of writing is smoother, quicker, and far less stressful. Because you don't have to keep stopping to do research, think about what you should cover next, or wonder how many words you've still got left, you'll find your words flow more smoothly and produce a far better essay in the end. If you're writing in a word-processor, you can use the Word Count tool to check how you're doing against the suggested word counts in your plan and adjust your pace accordingly. If your essay's boring to write, it'll be boring to read as well—but there's no reason it should be either. Why not set yourself the goal of writing something you really enjoy? Try to dig out as many interesting little nuggets of information as you can. Try to surprise yourself by finding some amazing facts. Look for interesting quotations on the subject from famous (or not-so-famous) people. Nothing says writing an essay has to be a chore. In my book, absolutely any subject can be interesting if you look at it in the right way—and that's the spirit in which to approach an essay if you possibly can. As long as you answer the question, cover all the relevant points, and defend your arguments, you can write whatever you please. So have fun and make your work interesting. An essay isn't a collection of unrelated facts and shouldn't read like one. Start with a decent, compelling introduction that makes people want to read on. Keep returning to the question periodically as you proceed through your different themes and arguments. Make links between paragraphs or themes with interesting transitions—the way DJs make links between a record they've just played and the one they're just about to. Ideally, make a strong link between each paragraph and the next, but use a simple transition to make a link if you can't think of anything better. For example, if you're writing an essay about the causes of World War II and you've just written a lot of material about the Versailles Treaty, you could move onto a new topic with a sentence like: "The Versailles treaty was not the only cause of World War II. Another factor was...". A few good transitions will help to knit your arguments together and make your essay read like something from a newspaper or magazine. Finish with a rip-roaring conclusion where you go back to the question and briefly summarize all your arguments. As I mentioned up above, the ideal way to write something is to leave time between writing, reading through, and then rewriting. Never hand something in without at least reading through it and correcting any mistakes. Ideally, leave a few days between writing and rewriting. How can you tell if your essay is well-written? Leaving aside the quality of your arguments, one good way to check the quality of your writing is to read your words out loud. Do they sound natural and smooth, like a speech someone's giving or something you're listening to on the radio? Well-written words should run as smoothly as well-spoken words. If your writing sounds convoluted or stilted, rewrite it! Thanks to the Web, it's an awful lot easier to cheat at essay-writing than ever before. But it's also an awful lot easier to detect plagiarism (copying from other people and pretending it's your own work) too. Any decent teacher can spot copied material a mile off, so you're just wasting your time if you cut and paste your essay from other people's work. Even if it's not instantly obvious, plagiarism is easy to prove: all your teacher has to do is paste one sentence from your essay into Google, in between quotes, and the place you copied it from will appear in about two seconds flat. Why even take the risk? You will learn nothing and have no fun copying someone else's work. Try to approach an essay as an opportunity to enjoy yourself rather than a thankless chore—and you won't feel half so inclined to cheat. When your teacher says the words "I want you to write an essay about...", imagine that they're really saying: "I want you to spend a day or two really enjoying yourself finding out something really interesting about..." Try to love it, not loathe it, and it won't seem half so bad. One of the things people consistently get wrong when they write for Wikipedia is misjudging the audience. Most people who read that site know little or nothing about the subjects they're looking up: they want to read a page of good information and come away a few minutes later having understood it. But Wikipedia writers often forget this and, instead, try too hard to satisfy or impress the handful of other people writing the same page—other enthusiasts or self-professed experts on the topic. You need to think clearly about whom you're writing for, what those people want to know, and adjust your writing style accordingly. You need a totally different writing style if you're producing a marketing brochure, a university textbook, a children's science book, or a leaflet about a political issue on which you're campaigning. 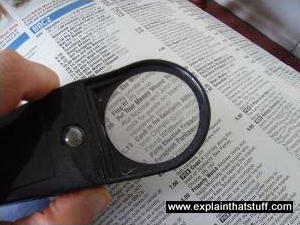 Photo: Be clear: people should instantly grasp the ideas you're trying to get across without having to peer through the mental equivalent of a magnifying glass! One of the worst things students do is write in a pseudo-academic style that tries to copy the stilted, puffed-up style you sometimes read in academic papers. Art students are particularly good at dressing up cloudy thinking in elaborate artist's statements that use big words like "juxtapose," "deconstruct," "ontological," and "signifier" to conceal small and trivial ideas—or the gaping vacuum where their ideas should be. Don't do it. Write simply and clearly and do your best to make yourself understood. As a student, your work is being read and evaluated by very intelligent teachers and professors who can see straight past puffed-up prose and instantly tell whether your ideas are any good. Unless you're writing literary fiction, it's always best to keep your writing clear and simple. Avoid long, convoluted sentences. Avoid complex parenthetical sentences (where you break off midway through using dashes, commas, or brackets and then return to what you were saying later). Be logical, be clear, and remember that you're trying to communicate your ideas rather than obscure them. How to Write Better Essays by Bryan Greetham. Palgrave, 2018. How to Write Essays, Coursework Projects and Dissertations in Literary Studies by Nigel Fabb and Alan Durant. Routledge, 2014. How to Write Essays by Don Shiach. Hachette, 2009. The Classic Guide to Better Writing: Step-by-Step Techniques and Exercises to Write Simply, Clearly and Correctly by Rudolf Flesch. HarperCollins, 1996. Literally a classic, authored by one of the proponents of writing clear and simple prose—plain English—tailored to what the audience can understand. The Elements of Style by William Strunk. An all-time classic guide to better writing, though somewhat dated now. Available for free on Project Gutenberg. A Dictionary of Modern English Usage by Henry Watson Fowler and Jeremy Butterfield (ed). Oxford, 2015. An idiosyncratic pick-and-mix of Fowler's peeves. Much good advice, but some dated nonsense too. The Perfect Essay by John Kaag. The New York Times. May 5, 2014. Why there's no such thing as the "perfect" essay. 301 Prompts for Argumentative Writing and 500 Prompts for Narrative and Personal Writing by Michael Gonchar. The New York Times, February 5, 2015 and November 13, 2014. These two Times articles offer a huge range of themes for essays. Teachers voice plagiarism fears: BBC News, 18 January 2008. Teachers acknowledge that copying work is a growing problem. Please rate or give feedback on this page and I will make a donation to WaterAid.